HomeInternet BankingHow to Register/Activate Corporation Bank Net Banking Online? How to Register/Activate Corporation Bank Net Banking Online? If you have an account with Corporation Bank and haven't yet activated Net Banking services, you are losing excellent opportunities of accessing banking services. You just can't get access Internet Banking facilities. First of all, you need to register your account for internet banking facilities and active the services. You need to follow the step-by-step process to register and activate Corporation Bank Net Banking services. With Internet Banking services you can easily transfer funds and track the transactions in your account without visiting the bank. You can use the services anytime and from anywhere without wasting your time. How to Register for Corporation Bank Internet Banking? Step 1: Visit the official website of Corporation Bank and download the CorpNet application form as applicable, i.e., Retail Form and Corporate Form. Fill it up providing the required credentials and don't forget to sign the application form in the provided place . Submit the filled application form to your branch and they will forward it to the web center of Corporation Bank in Bangalore. 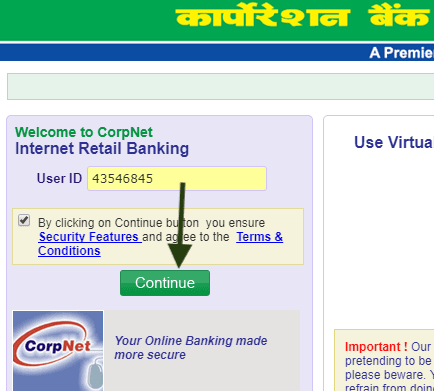 Step 2: Your account will get activated for CorpNet of Net Banking by the Web Centre. The Web Centre will assign User ID and 2 Passwords. With one password you can access the account details while with the other password you will be able to authorize the request for transactions. Step 3: You need to collect the internet Banking Kit containing User ID and Password details, from the branch. Once you obtain the User ID and Passwords, you can log in to your account online and access the Internet Banking services. Step 4: Visit the official website of Corporation Bank http://www.corpbank.com in your web browser. Select 'Online Services' from the Tab Menu featured on the right side of the webpage. You will get directed to a new page displaying several instructions. Click on 'Click to Continue' button to proceed ahead. Step 5: You need to change the by default User ID received in the Kit. Enter the User ID received in the Kit in the provided box featured left side of the new page and click on 'Continue' button. 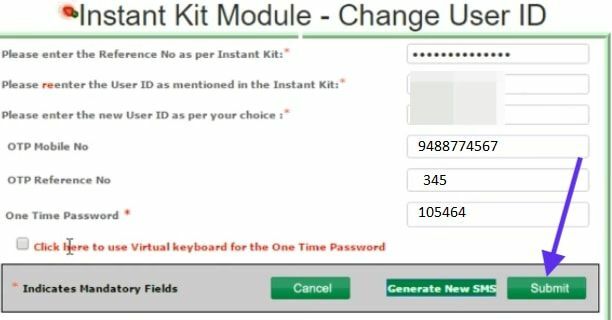 Now you need to enter Password as in the Kit and click on 'Login' button. Step 6: You will get directed to a new page where you need to enter the Reference number as per the Instant Kit two times and at last enter the new User ID of your choice in the provided boxes. Click on 'Submit' button. Step 7: You will receive a pop-up message on the screen. Read it and click on OK to proceed further. Now you need to enter the OTP number received on your registered mobile number and click on Submit button. You will receive a message about changing the User ID successfully. You need to click on Exit and wait for sometime as it would take few minutes to register the newly set User ID. Now you need to change the default Password. Step 8: Once again visit the official website and click on Online Services you will get a menu on the screen. Select Personal Banking and click on GO button. Click on 'Click here to Continue' button. Enter the New User ID and click on Continue. Enter the Password in the Internet Banking Kit and click on Login. You will get directed to a new page. Scroll down the page and click on I Agree button. In the new page displayed on the screen, follow the instructions and enter the credentials likewise. You need to enter the Login Password as per the Kit and also enter the New Password. Note: Make sure to enter an alphanumeric password! You must remember, the User ID and Password are case sensitive! Step 9: Enter the Authorization Password as specified in the Internet Banking Kit. Set the new Authorization Password. 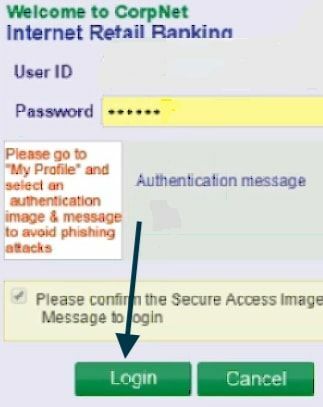 Select the Authentication Message and Select Secure Image Category and click on Update button. You get a confirmation message on the screen about successfully resetting the Password. Click on 'Please Login Again' to proceed ahead. Get back to the home page of Internet Banking Login page and use the new User ID and Password to login. Now you have successfully activated the Corporation Bank Internet Banking. You can use the banking facilities offered by Corporation Bank through online, and you need not waste your time to access the services. You can login to corpbank net Banking services and access the services from anywhere and anytime with your feasible time! I am unable to register for Internet Banking. Please send the procedure to my ID. Above one is too difficult to register a customer for Internet service. I Am not able to register online for net banking. how can apply for net banking without form submission branch? It has an online form submission services or not??? How to get user id for corporation net banking online. How to download the corporation bank net banking online registration form? I am not able to register for internet banking by using above method. Sir please update the toll free number to get help related net banking registration from customer care executives.